Free Airtel Recharge Trick of worth Rs 50 on PhonePe app with Proof. PhonePe app is a UPI app created by Flipkart company PhonePe brings a great deal for Airtel users.We are going to provide you with a Free Airtel Recharge Trick of worth Rs 50 on the PhonePe app.PhonePe app gives this 100% cashback on Airtel recharge occurred in that offers period.Users can take Rs 50 as Maximum cashback.Airtel users can only take this Free Recharge of Rs 50.Newly registered and Existing users both can take this recharge opportunity. Read Terms & Conditions below. The offer period will available from 1 Nov. to 11:59 pm on 10th Nov.So, Hurry up and grab this free recharge. If you haven't registered on this app Download it from Click here and register to it. Existing users go to login option. After that Choose any Airtel no. in your family or your Friends no. You have to do a recharge or bill payment of Rs 50 or more. Recharge or Bill payment can be done by different mode like your UPI, PhonePe Wallet, Cards. 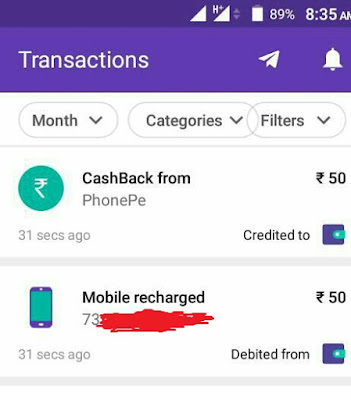 Just after Successful of your Recharge, After sometime a cashback of Rs 50 will credit in PhonePe wallet. You can utilise your cashback to recharge again. Users can take 100% cashback up to Rs50 on Airtel Recharge. If you are doing a recharge of 349 or above you get Rs 75 cashback. Offer available for only once per user. Users can use this offer on Ios and Android Devices. Cashback will be Credit within 24 hours after successful recharge. Cashback money can't be withdrawn or transferred to others. Cashback money can be used for Recharge, Shopping. The transaction must be done by the users on PhonePe app. PhonePe has all rights regardings to that offer and can end this offer any time. 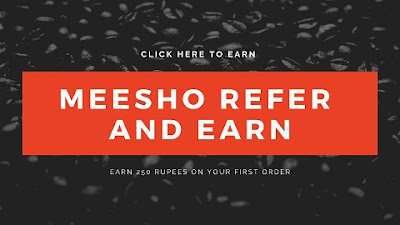 Also if you have exceeded limit of Rs 20,000 on this app your cashback will be credited on very first day of next month. Thanks For Sharing This Trick, Works Fine.I Really Appreciate You For This Post. It Was Really Helpful. Keep It Up And Thanks Again.